We finally have the successor. After a troubled launch in late 2015 of the original Surface Book, Microsoft seemed to drag their feet when it came to updating what was one of the most interesting notebooks released in the last couple of years. 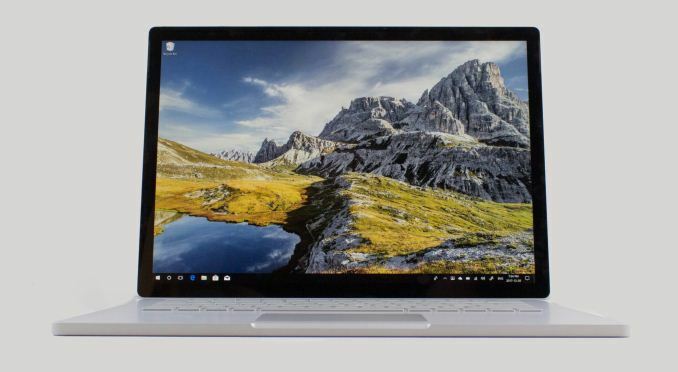 The original Surface Book launched with some serious power management concerns, which were eventually sorted out, but then the company just left the model relatively untouched, except for a mid-generation update with a stronger GPU. The wait is over though. Microsoft has released the Surface Book 2 as a worthy successor to the original, with many improvements. With the launch of the Surface Laptop earlier this year, which targets the $1000 price point, Microsoft was free to ratchet the Surface Book 2 up in performance, and price, and they’ve doubled the number of models, with both a 13.5-inch version, being the upgrade from the original, and a new 15-inch model which clearly targets the performance-starved users. For this review, Microsoft sent us the larger 15-inch model. Both the 13.5 and 15-inch models are shipping with the latest Intel Core i7-8650U CPUs, offering four cores and eight threads, and a 4.2 GHz Turbo. RAM stays the same with either 8 or 16 GB of LPDDR3, and that’s because Intel CPUs don’t yet support LPDDR4, which is a shame. Storage is 256 GB to 1 TB of NVMe SSD. So far, we have a pretty typical notebook for late 2017. The difference with the Surface Book 2 is the GPU, which is optional on the smaller model but standard on the 15-inch version we have today. Microsoft packed as much GPU as possible into the Surface Book 2 models, with the 13.5-inch offered with an impressive GTX 1050, and the 15-inch model shipping with a GTX 1060. To put that into perspective, the 15.6-inch Dell XPS 15 offers the GTX 1050, so the smaller Surface Book 2 has as much GPU power as the Dell, which is fantastic. The larger Surface Book 2 gets the much more powerful GTX 1060, featuring twice the CUDA cores as its smaller brother, and four times the ROPs. The model numbers are similar, but the GTX 1060 is going to offer a lot more compute. After shunning the port for the last couple of years, Microsoft has finally added USB-C to the Surface Book 2, replacing the mini-DisplayPort. Their reasoning for not including it before was that USB-C is a confusing port, where they all look the same, but offer different capabilities, and that’s a fair point, but it also makes it more confusing that they didn’t include Thunderbolt 3 on the Surface Book 2, meaning the USB-C port on the Surface Book 2 doesn’t offer the full capabilities of the port. The company seems to have an aversion to making everyone happy. The USB-C port does offer DisplayPort output, as well as power delivery, but the lack of Thunderbolt 3 deprives the owner of the ability to output dual UHD video feeds, despite the performance of this machine, and that’s a shame. The larger Surface Book 2 15 offers an impressive 85 Wh of battery capacity, and that’s due to the unique design of the Book, where the detachable tablet offers 23 Wh of capacity, and the base offers another 62 Wh. The device is designed to have the tablet attached most of the time, but with the ability to remove it for certain tasks. This isn’t an Ultrabook though. The smaller 13.5-inch model starts at 3.38 lbs (1.5 kg) and goes up if you add a GPU, and the larger 15-inch model weighs in at 4.2 lbs (1.9 kg). This is a device designed to offer portable performance, and here the weight isn’t as much of an issue. It still comes in slightly lighter than an XPS 15, despite a GPU with double the CUDA cores. The most interesting aspect to the Surface Book 2 continues to be the design though, so let’s start there.